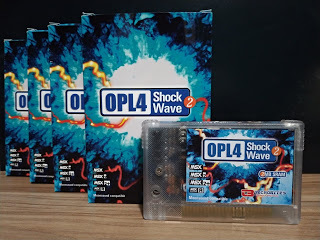 Tecnobytes Classic Computers: New OPL4 Shockwave 2 batch!!! New OPL4 Shockwave 2 batch!!! We are starting a new campain to produce a new OPL4 Shockwave batch, the OPL4 Shockwave 2! We've got a new design, P2 stereo output and 2 MB of RAM! The OPL4 SHOCKWAVE 2 is smaller than your predecessor and fits in a small cartridge case. As the new size will not accept the RCA connectors, now we have a P2 stereo output. The OPL4 sound is mixed with the internal MSX sound. 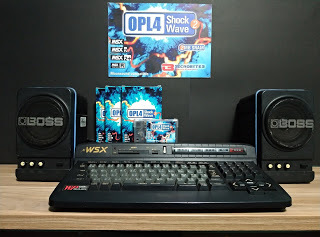 So you can listen the OPL4 Shockwave 2 sound through the MSX sound output (mono). The OPL4 SHOCKWAVE 2 have twice the RAM capacity of the original OPL4 (2MB against 1MB). 1. We need at least 20 units to produce.